Aaaahhh. Im super tired! Have been rather busy recently, rushing from place to place and reaching home late at night without much energy to even transfer photos, much less energy to even edit them. Lots to blog about, but shall not dump everything to one entry. Haha. Afew days ago was daddy and mummy's 20th year anniversary. 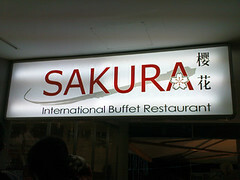 They decided to have two big lightbulbs beside them, so they brought me and sister along for a feast at Sakura Buffet! I totally love Sakura. There are endless things to eat there, and you'll definitely eat more than you can actually hold there. It's only $24++ per person! here are the pics that i took. kinda lazy to elaborate much about it.